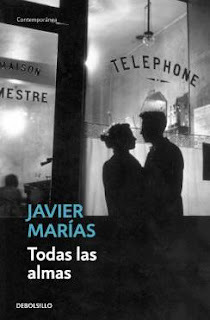 I read Marías in the handsome Spanish﻿ edition pictured up top. An English translation by Margaret Jull Costa was published by New Directions in 2000 in a slightly less garish cover than usual for that publishing house. Marías's Spanish editions ARE handsome, I agree. I was admiring them at the bookstore just the other day, and also perusing Tu rostro mañana. Really want to read in Spanish & so don't think I'll be up to it by this summer. But will definitely look forward to yours and Frances's thoughts. Hey, I've read this one. Did it make you want to visit Oxford just to go book shopping? I read the novel back when I spent a little too much time in used book stores, and the pull was palpable. Eager to hear what you think about the "sequel". Maybe I'll read it, too. *Emily: Marías seems to like to begin his works with a big shiny diamond of an opening line and then to double back to the intro again and again in the course of the novel to polish the rock and magisterially examine it from different perspectives. The craftsmanship's very impressive. While I understand your reluctance to take on the über-long Tu rostro mañana in Spanish this summer, I think you'll find no shortage of shorter Marías temptations in the bookstore if you stick to those lovely covers in the new Debolsillo line and avoid those seriously ugly New Directions ones! *Amateur Reader: That "anti-novel" Dark Back of Time is near the very top of my Marías list once I get done with the YFT trilogy and maybe A Heart So White. Sounds like an interesting sequel, no? Glad you bought up the matter of the used/antiquarian bookstores in this novel since that was one of the things I wanted to mention but couldn't find room for in my post (I mean, not that I needed any additional reasons to want to visit Oxford someday, but that definitely provided some extra incentive). I'm curious, though, whether you read this one just for "fun" or whether the Gawsworth/documentary photos in fiction angle spurred you on as part of your interest in Sebaldiana. Care to comment on that? *Jill: "Do the dead eat cookies?" might be more a Henry James than a Javier Marías question, but I'm glad you didn't scald yourself over that one "mean" line that was sort of the pretext for my post! 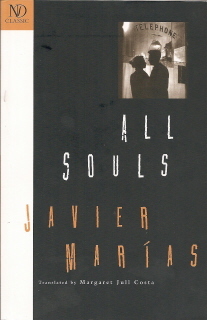 In all seriousness, though, Marías' concern with the dead here is at least partly related to his narrator's loss of two friends to the great beyond and to how we still are connected with friends who have passed away even after they've stopped living. It's more philosophical than gloomy in other words. I haven't heard of any of Marías' novels that sound bad but I'm quite in the mood to start with Mañana en la batalla. I have been to Cambridge several times but not to Oxford. Any reason is good to visit England. *Caroline: I think Corazón tan blanco and Mañana en la batalla piensa en mí used to be thought of as Marías' best until Your Face Tomorrow came out and complicated the rankings a bit, but he has a lot of works that sound fascinating to me all of a sudden, that's for sure. And even though I'm much more interested in British music than British literature, I'll definitely heed your advice about the "reasons" required for visiting there. Cheers! I'm not a great fan of Marías, I admit. The thing I remember about this book, though, is that at one point he describes waiting on Didcot station. As someone who has many times stood waiting on Didcot station, it seemed strange to me a Spanish writer should be describing a direct experience of mine; and I felt I'd have liked to have explained to him a bit more about Didcot, since it's a place I've known well all my life. I'm glad you highlighted the humor. I have certain favorite funny scenes here (the High Table, for one). The playful sequel, Dark Back of Time, is just as exquisite, if not more so. Its opening is probably my favorite of his. *Obooki: I can't think of that having happened to me with a book before, but it must be curious to say the least to see someplace mentioned by a foreign writer that you evidently know so well. On an unrelated note, I see that you've read several other Spanish authors that I haven't but who are on my TBR--so maybe we can agree on a non-Marías novelist from Spain one of these days soon. Cheers! *Rise: The High Table and Oxford disco scenes were funny indeed, but I really enjoyed that meditation on the single man's relationship with his trash. Unexpected but perfect! Also glad to hear that you think so highly of Dark Back of Time. Looking forward to that one. Cheers! This is the only Marias I've read. I missed the Proust connection, I should have another look at it now that I'm in Search of Lost Time again. Something lost in translation maybe? I can't read Spanish. *Bookaroundthecorner: The Proust similarity's more apparent in Tomorrow in the Battle Think on Me, but I'm basically just thinking of Marías' tendency to slow down the pace and just observe a scene with extreme detail for pages at a time (like in the sequence in All Souls where he talks about the bachelor's relationship to his trash). The translation thing's possible, too, though: I notice that sometimes English translators prefer to break up longer sentences translated from Spanish or French rather than letting them "run on" like they do in the original. I really need to read Marías one of these days. Would you say "Mañana en la Batalla" is a good start? *Stefania: Mañana en la batalla piensa en mí is a wonderful place to start with Marías--such lovely writing throughout and very soulful as well. Cheers! I really enjoyed your review, Richard! Thanks for altering me to this - I'll add a link to my recent post. Marias is just so good when it openings, isn't he? The first paragraph of A Heart So White is another killer, possibly the best opening I've come across in my recent reading. I like how you've picked up on the elegiac tone. It's rare to find a writer who can combine the melancholy with the humorous to such great effect.